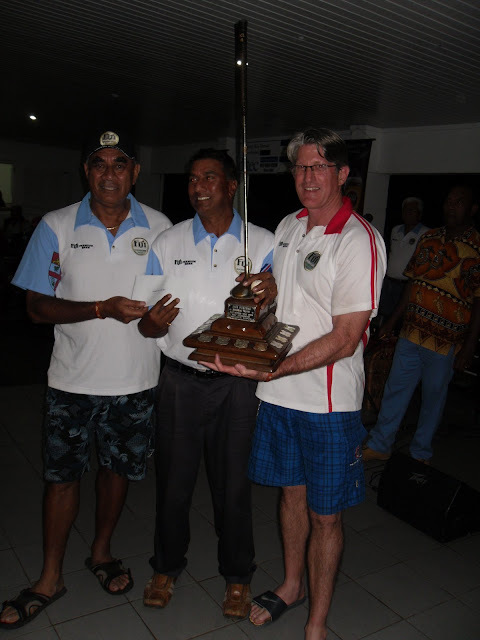 Despite a gloomy weekend that was experienced around the country during the national day weekend, 125 keen golfers braved the weather to play in a Fiji Premium sponsored 3-day Fiji Golf Club Open at Vatuwaqa. The tournament was won by PC Goundar, who scored a best overall gross, 6 over, 222 over the three days. Ravinesh Goundar, 228, and Eric Nand, 232 earned second and third places, respectively in the overall gross score for men. Overall net score for three days for men was won by Jiang Ou, 201. The second and third overall net prizes were won by Ishwar Nand, 202 and Jack Reddy 205, respectively. In the ladies’ division, a national women’s representative, Gye Oh, 238 and Merelita McCarthy 216 won first prizes for best overall gross and net, respectively for three days. Zia Buksh, 74 won a best gross prize in A grade, while Susau Managreve, 82 and Kyeong Yeol Back, 87 won best gross prizes in men’s B and C grades, respectively for day-one of the tournament. The best net prizes for day-one were won by Jacoro Ratubuli, 69, A grade and Muni Sagayam B grade, while Vijeshwar Datt won the C grade. Kelera Watling, 83 and Shun He Lim, 75 won best gross and net respectively in the ladies’ division for the day-one of the tournament. The day-one longest drives on ninth and eighteenth holes were won by Jacoro Ratubuli and David Oakley, respectively. The nearest-to-pin prizes on the first day were won by Zia Buksh, second hole, Vijay Madhavan, fifth hole, Roy Ugra twelfth hole and Vinod Chand for the sixteenth hole. The daily best gross prizes for men’s A, B and C grades for day-two of the tournament were won by Jung Yunho, 78, Mervyn Low, 82 and Ravin Lal, 86 respectively. The respective best net winners for men’s A, B and C grades for the day were Feizal Haniff, 68, Joe Rodan, 66 and Hui Shun, 66. The ladies’ division winners for day-two were Ufemia Naisara, 90 for the best gross and Janice Hinton, 68 for the best net. The prizes for longest drives for day-two were won by Rizwan Hassan, first hole and Alvin Sharma for the tenth. The nearest-to-pin prizes for day-two were won by Francis Chung, second hole, Mervyn Low fifth hole, Filimone Kau, twelfth hole, while Caesar Lateef won the sixteenth hole. The daily prizes for day-3 of the tournament for best gross in men’s A, B and C grades were won by Ramesh Goundon, 86, Sung Sik Oh, 85 and Peter Eafeare, 88. The best net prizes were won by Cecil Brown, 71, Jai Lal, 73 and Sir Timoci Tuivaga, 71 in A, B and C grades, respectively. J R Yoon, 90 and Ji Sook Kim, 73 won prizes for best gross and best net, respectively in the ladies’ division on the final day. The nearest-to-pin prizes on day-3 were won by Merelita McCarthy, second hole, Ravinesh Goundar, fifth hole, Katsuji Fujita, twelfth hole, while Mervyn Low won the sixteenth hole. The two prizes for longest drives on the final day of the three-day tournament were won by Kelera Watling, ninth hole and David Oakley, who also won his second prize for longest drive on the eighteenth hole on the final day.